You do need to mash, pulse, blend, or otherwise baby-food these greens to befit the cause. And when using tougher, meaner greens like kale, it’s especially important to break it down into a coarse sauce. This step was unintuitive to my experience with cooking leafy greens. It’s not a soup, but something meant to be sopped up with naan, or a pile of basmati rice. I’m not sure what it is. But it played a perfect complement to another vegetarian side dish of chickpea and tomato curry for my last lunch, and I couldn’t get enough of the saag. While classic saag recipes call for simply boiling the leafy greens, squeezing them out, and pureeing them, I decided to roast the trimmed kale first. This would impart a deeper, roasty flavor as well as soften the greens a little before the soak. Once the leaves were roasted, I followed suit with most recipes for Sarson Ka Saag I could find. Which is to boil the greens (kale, instead of mustard greens here) with some spinach to make the final dish more silky and delicate. 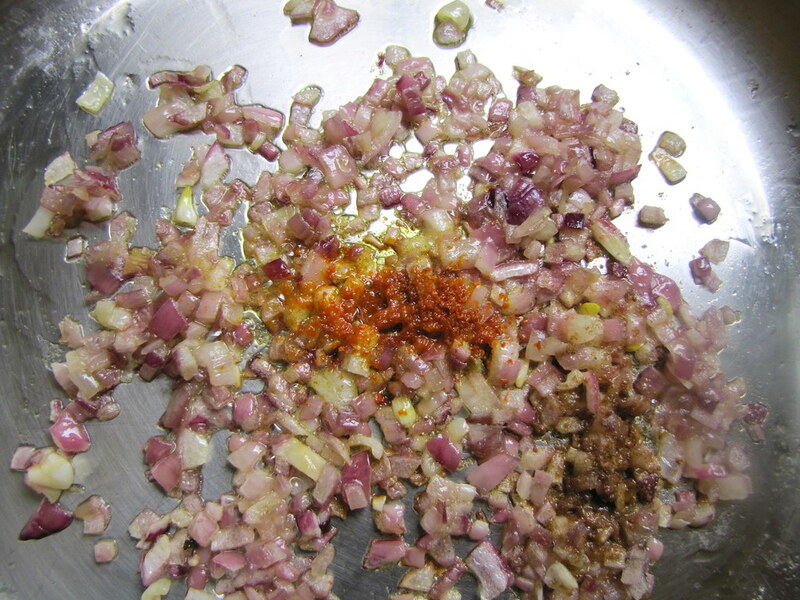 In a separate pan, a finely chopped onion sizzled with an assortment of spices, garlic and fresh ginger. 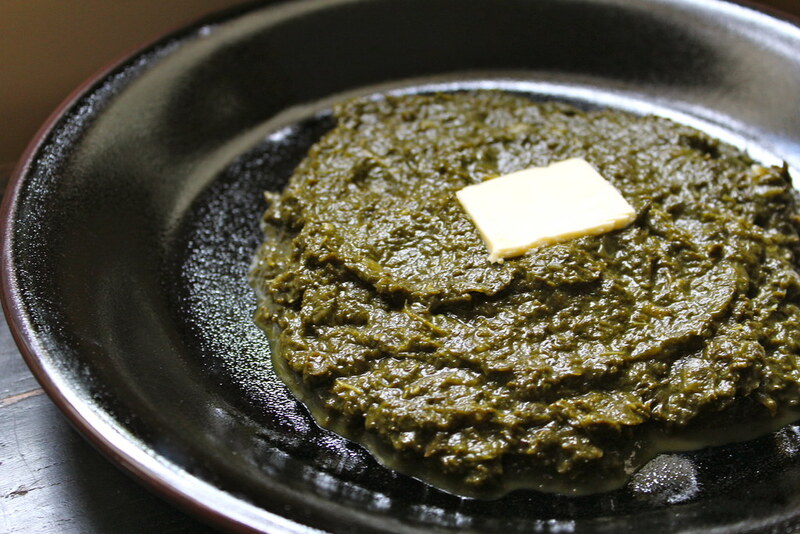 A popular variety of saag is cooked with paneer, a firm, Indian fresh cheese. I didn’t go with this option, if only because paneer was more difficult to find than the rest of the ingredients (although I did chance upon a very clever recipe in Bryant Terry’s new cookbook, The Inspired Vegan which called for roasted chunks of tofu instead). And since I was serving a more flavorful curry along with the saag, I didn’t heap on the dry spices for the latter dish: some coriander, cumin, cayenne pepper, mustard seeds and turmeric along with the fresh garlic and ginger. 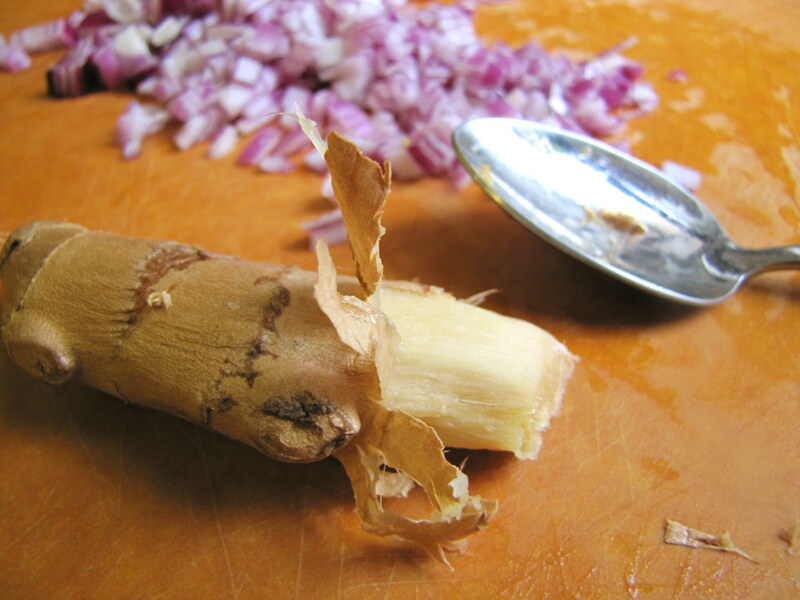 I guess that sounds like a lot, but you can always use a trusted curry blend, or garam masala from a fresh canister. Not that you need it, but I happened to have a whole turmeric root to use, thanks to a friend who traveled around the world and stopped in India for spices. (That’s easy enough to get someone to do, right?) 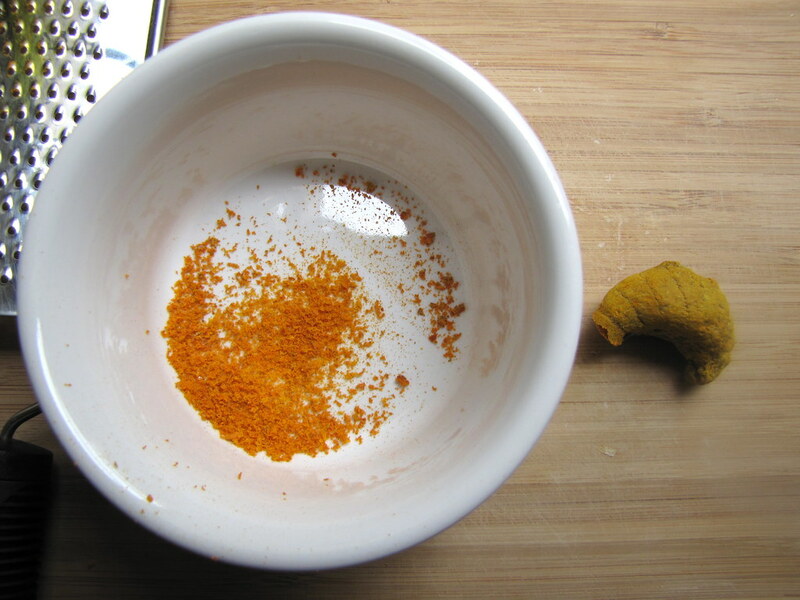 The freshly grated turmeric was brighter orange-yellow, with a distinctive taste that only can be described as… turmeric-y. Finally, the greens and the onion-spice mixture meet, along with a few heaps of butter (or ghee to keep with Indian tradition, which is essentially clarified butter). 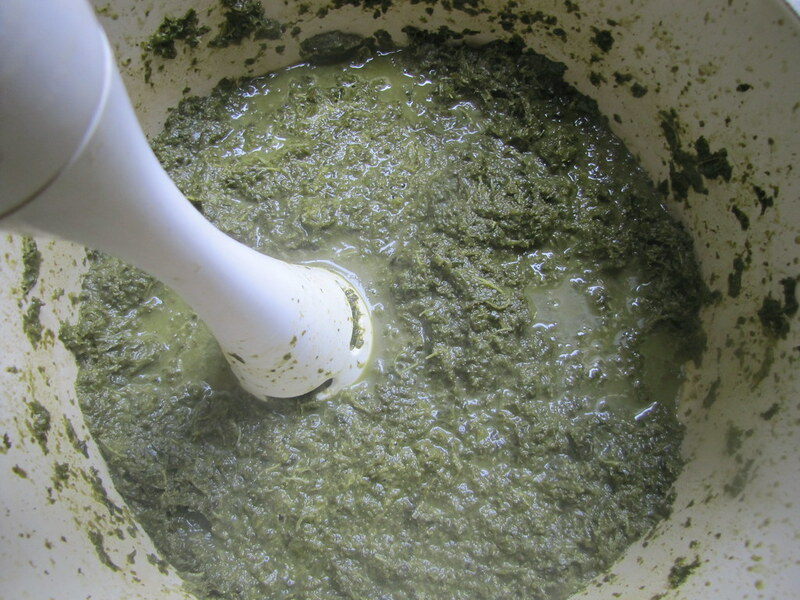 The greens are blended first, in some of their cooking water until a loose paste. A few pulses in a food processor or blender will do the trick; I wouldn’t recommend trying the hand blender with kale leaves, since it took so long to break them down. After stirring it all together and cooking to let their flavors meld, the saag (with kale and spinach) is essentially done. It’s quicker than the steps here might sound, and allows plenty of opportunity to cook other dishes in the same time. That’s recommended if you’re having guests over, because I’m not sure how they’d react to a single pile of one-dimensional, dark-green slime. I once hosted a contest here that called upon food bloggers to post their most ugly, but tasty dish. An eggplant dish won that round. Here’s to another good entry for that. Preheat oven to 450 degrees. 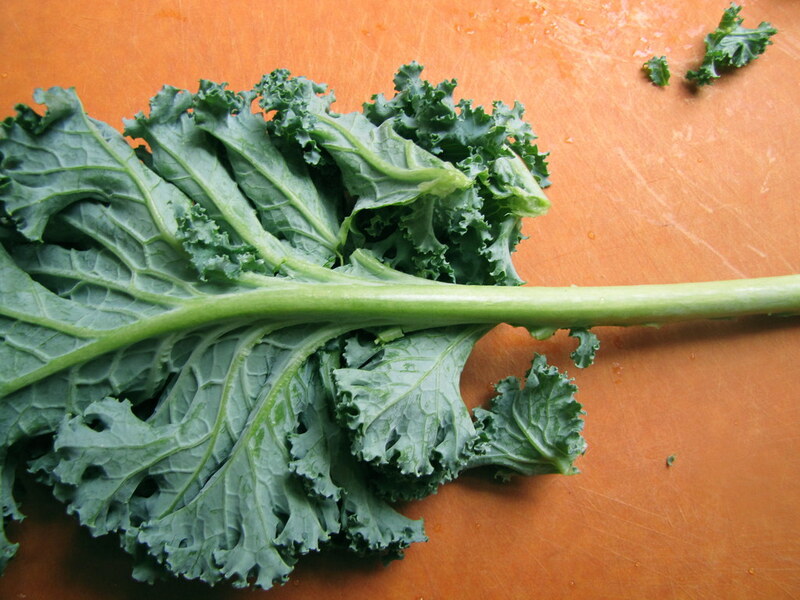 Toss the chopped and stemmed kale pieces with the oil and a shake of salt. Roast on flat pans for 3-5 minutes, or until just lightly browned in parts. Transfer to a pot and fill with just enough water to cover. Bring to a boil, then cover and simmer for 20 minutes, adding the spinach leaves in the last five. In another pan, heat a tablespoon of the butter and add the onions. Season with a little salt and cook, stirring occasionally, over low heat until softened and a little caramel, about 8 minutes. Add the garlic, ginger and all the spices along with another tablespoon of butter. Cook, stirring, another few minutes. Transfer the greens to a blender or food processor along with about 2 cups of their cooking water (you may need to work in batches). 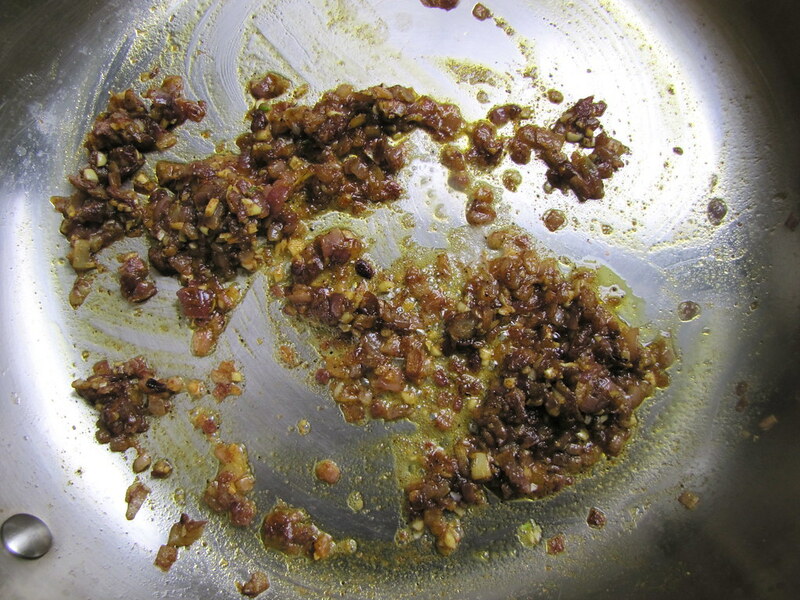 Blend in quick bursts, stopping to scrape down the sides, a few times or until mixture just forms a thick paste. Transfer to the pan with the onions. Bring mixture to a gentle boil and cook, stirring occasionally, and adjust seasoning as desired. Sprinkle in the flour and stir to incorporate well. Transfer to a serving plate and place a pat of butter on top. Serve with rice or naan. Three brownie points: It’s amazing how small the dish is in the end from the mounds of greens that are cooked down in it. Every bite is like eating a big salad of greens. Kale and spinach are amongst the most nutrient-dense greens, to begin with. Make that two big salads for each small portion here then — filled with Vitamin K and C.
Seven maple leaves: Definitely green in color, this dish is friendly on the environment in many ways. 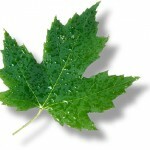 Its main component is kale, a hardy winter green that can be found this late into the winter season locally still. So can onions, and while spinach was apparently out of stock at last weekend’s Greenmarket, it’s likewise a low-impact superfood. No local points here for the turmeric smuggled from India. Wow! 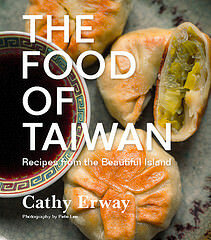 this looks great – I have been massaging my kale to make raw kale salad. This looks, ok maybe sounds, amazing. We bought a ton of kale last weekend, and I have been racking my brain for different ways to prepare it. This comes at the perfect time. Thanks. This is a genius idea – I love saga. It never finishes in the winter in India. 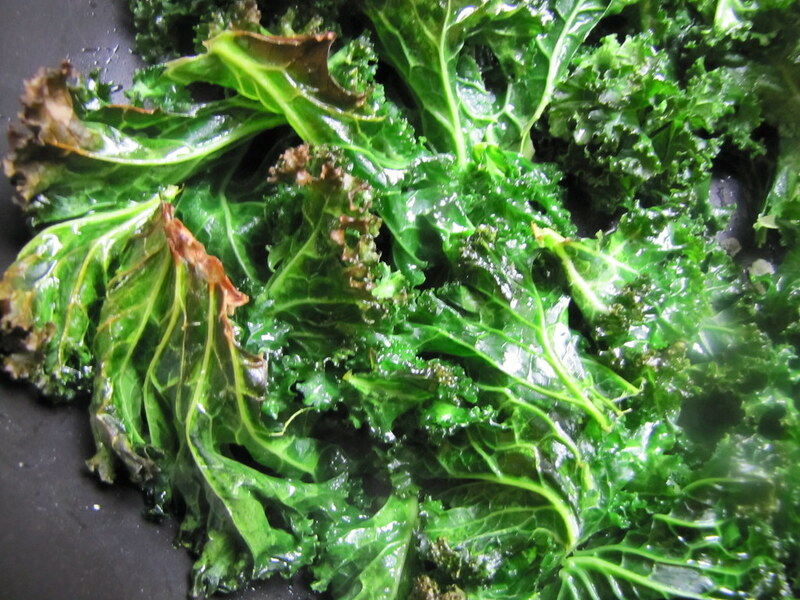 We normally make it with mustard greens and spinach, but kale is a great idea. Sometimes the least photogenic foods are the best tasting. I’m usually a sucker for saag paneer at Indian restaurants, even though it’s one of the most “unsightly” ones. Anyway, if you do happen to find a source for paneer in Brooklyn, please let me know! Diana, if you live anywhere near Sunset Park there is a great little Indian grocery, named Patel grocery, next to the 53rd st R train in Sunset Park that sells blocks of paneer for $5. They also have a great selection of Indian spices in large quantities for low prices. I believe there are also a number of places in the Kensington/Ditmas Park area that sell it too. Geetika, huge compliment coming from you! Best place for Indian spices in the city is Kalustyans on Lexington. Worth a field trip from Brooklyn – could combine it with a visit to Eataly. Can you substitute Swiss Chard for kale?